With one push of a button you can post your location to Facebook or Twitter. So now your friends know what you’re doing and where you’re doing it. It’s that easy! GPS Tracking Lite Version 1.3 boasts a new bold graphical interface as well as Turn by Turn directions and you can send a text along with your location. You are also presented with a map of all GPS Tracking users around you. 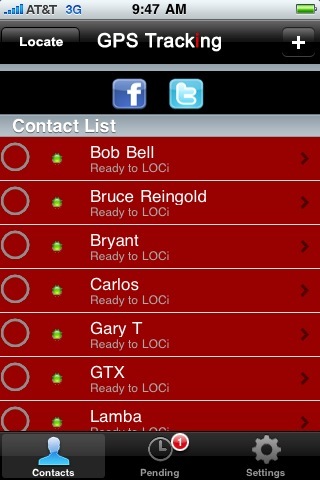 Thanks to you, GPS Tracking by LOCiMOBILE has been downloaded well over 100,000 times. To thank you we are giving away some great prizes in our GPS Tracking Valentine’s Giveaway. Three lucky winners will walk away with a beautiful bouquet of flowers or a valuable iTunes gift card (the choice is yours.) If you have not registered for the free giveaway, you may sign up here. Thanks again and good luck in the giveaway! France makes a decisive push to overtake the United Kingdom in this week’s “iPhone GPS Apps download statistics by a country” contest. Singapore continued their push to overtake Canada and place third this week. Canada falls a spot to fourth just ahead of Australia who trails (among the top five.) Will the Canadians and the UK fight back? Only time will tell. Australia holding strong in 5th place. It will be interesting to see if the Germans and The Netherlands can push Australia off the chart and make the top 5 next week.